This flower grows from 1 to 2 feet tall. 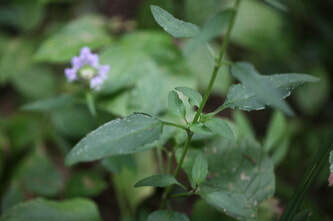 It has whorls of 3 to 10 lavender to blue flowers surrounding a square stem. The flowers are about 1 inch long. The corolla is 2-lipped, with the lower lip being longer than the upper lip. 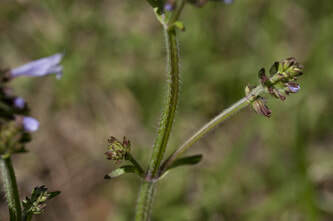 The basal leaves are lyre-shaped. The exposed lower lip of salvias provides an excellent landing platform for bees. When a bee lands, the two stamens are tipped and the insect is doused with pollen. 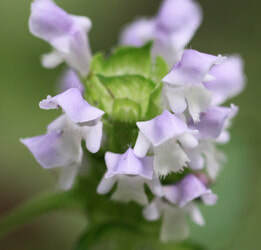 This flower is found in sandy, open woods, thickets, and weedy sites. It flowers from April to June. This flower grows from 4 to 20 inches tall. 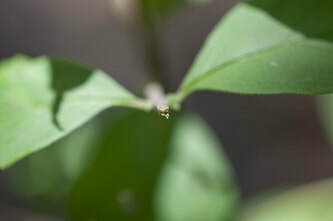 The leaves are toothed or entire, lanceolate to broadly ovate. 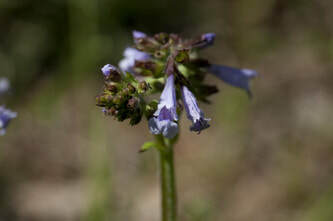 There are blue-violet flowers that appear on a terminal spike. The upper lip of the corolla is entire while the lower lip is shorter with three lobes. The middle lobe is fringed. This in an introduced perennial. 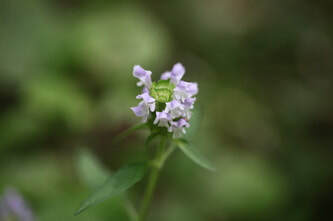 A form that flowers when only 2 inches tall is a common lawn weed. 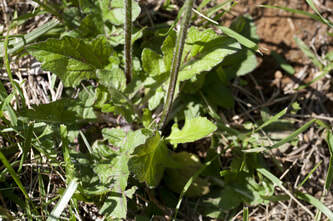 The common name comes from the plant's wide use as an herbal remedy for throat ailments. This flower is found in gardens, fields, and roadsides. It flowers from May to September. This plant grows from 16 to 48 inches tall with short, hairy stems that are branched above. The leaves are toothed, and the leaf stalks are from .2" to .6" long. The flower heads are loose and from .6" to 1.4" wide. 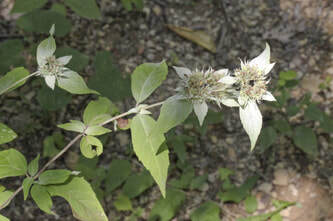 The upper leaves are velvety and whitish above. These plants, particularly the flower clusters, have a very strong odor when crushed. This plant flowers from June to September. It is common, and is found in barrens and wood edges.